When I find a bowl of Tzatzki in front of me at a Greek restaurant I could (almost) skip the main course. There are two other dishes that have the same effect on me, fresh, warm bread with salted butter and hummus with flat bread! There is something about the Greek dip which is so simple yet it makes me want to dip a piece of bread into it again and again. It’s like having a great cake in front of you that you just can’t stop eating until you realise half the cake is gone! When we have a barbecue with our friends, we always start to nibble on some salads, my Tzatziki and bread while we’re waiting impatiently for the coal to settle. So often we get carried away with the creamy dip before the meat is even done! So no matter where I prepare this dip for friends and family, I always get requests for the recipe, every time I make it. 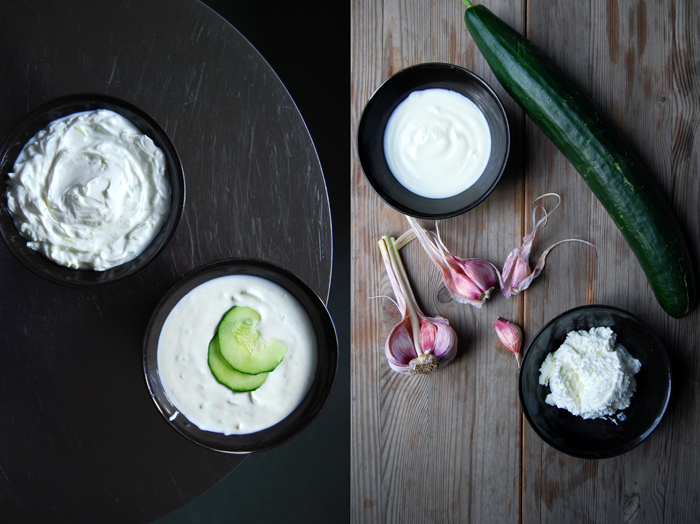 There are many ways to make a delicious Tzatziki, I’ve tried this dip made with Greek yoghurt, Alex, my Greek-German brother in law uses soured milk and I use quark. 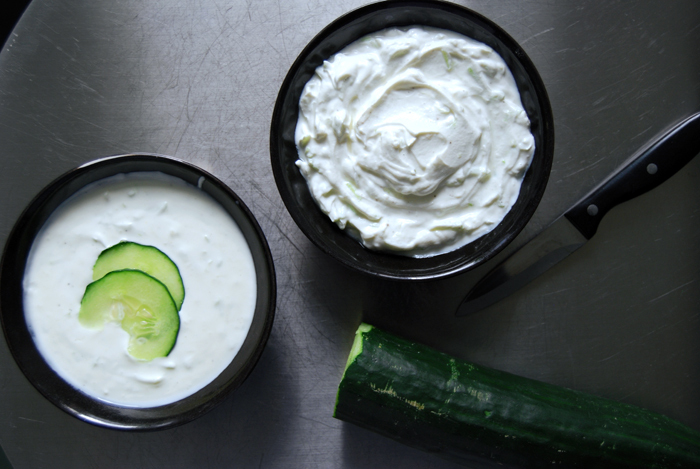 I mentioned it when I wrote about my German Cheesecake last Sunday, to me, low fat quark mixed with heavy cream makes the best Tzatziki. Although Alex chooses a different dairy product, he enjoys eating my “German-style” Tzatziki a lot! Another important point of the recipe is the right processing of the cucumber (preferably organic as they have the strongest taste). 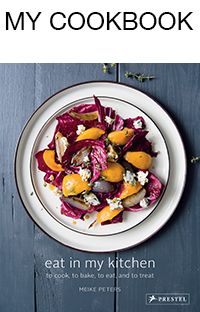 It has to be roughly grated and pressed between the hands to release some of the vegetable’s juices to achieve a more concentrated flavour and a better texture. It’s best to use fresh, moist garlic, my favourite is the young French garlic when it’s light green and purple, and the rest is a question of the right ratio according to your taste. 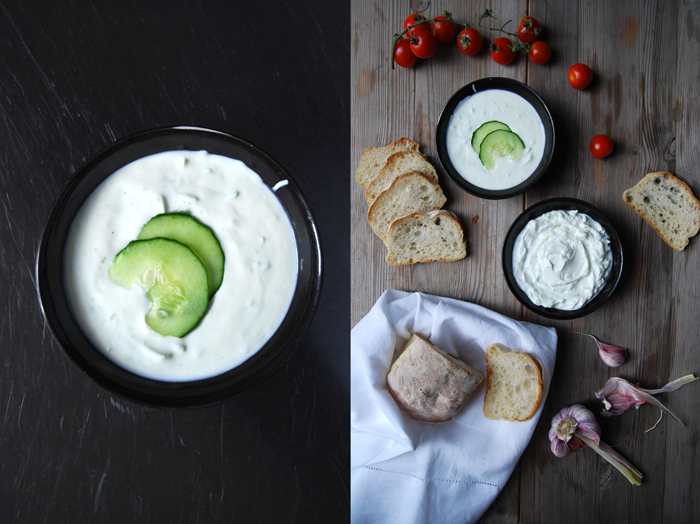 It’s my Sandwich Wednesday today and I didn’t want to leave out those of you who can’t get quark, so here are two Tzatziki recipes, one is made with yoghurt. Tzatziki is also great on potatoes grilled in foil at a barbecue! 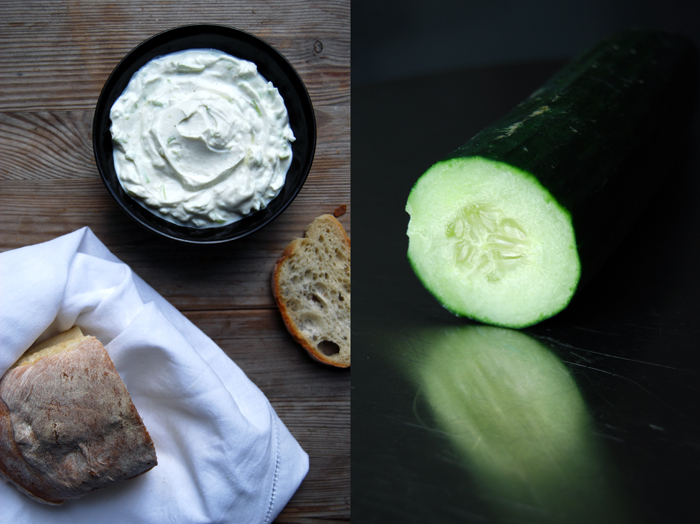 Let’s get started, all you need is a fresh loaf of your favourite white bread and a big bowl of Tzatziki! 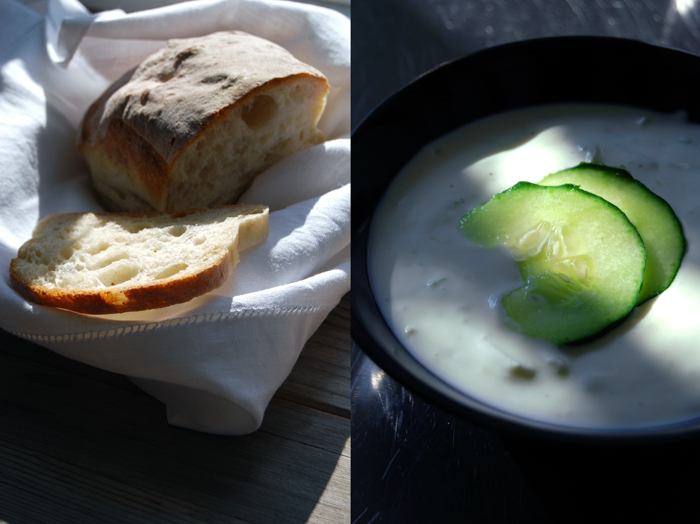 Mix the cucumber with the ingredients of version 1 or 2, season with salt, pepper and garlic to taste and whip in more heavy cream if you prefer a more creamy texture.